Come and enjoy the cool, coastal vibe at Sun Studio - only a minute’s walk to Quinns Beach. Facilities comprise a modern fully functioning kitchen including refrigerator, electric oven, gas cooktop, microwave oven, kettle and toaster with cutlery, crockery and cooking utensils all provided. Other appliances include washing machine, reverse cycle air-conditioner, 40 inch flat screen TV and free WIFI. A media player provides free Netflix, Youtube and Internet browsing. Separate bathroom and toilet facilities incorporate an oversize shower and double vanity. Chill out on the large, comfortable sofa and go to sleep to the sound of waves breaking in the Queen size bed. Dine inside or outside depending on your preference. The beach is king in Quinns. It is a beautiful, white sandy beach and relatively safe for swimmers. You often get it to yourself and you can walk for miles along it with dolphins being a common sight. 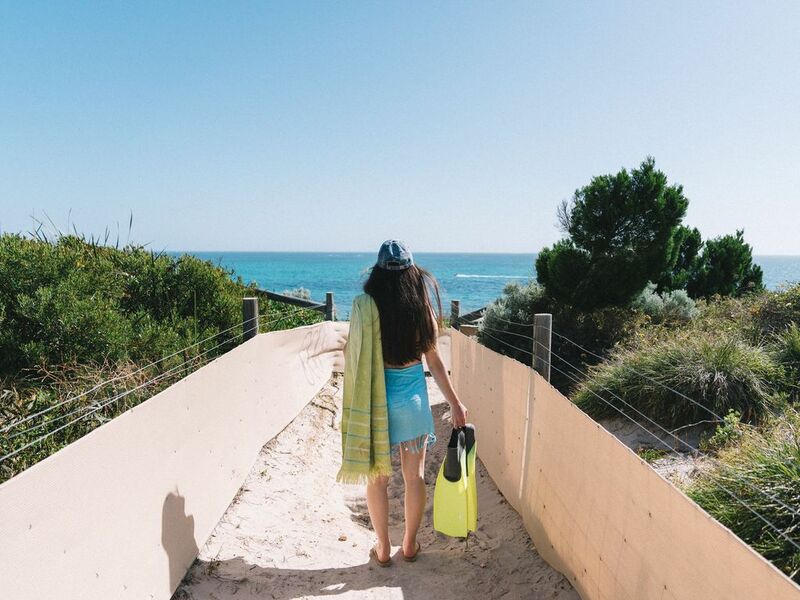 A recently added shark net swimming enclosure and regular beach patrols ensure your safety. The surrounding area - "Old Quinns" - is an older, leafy suburb traditionally used as a popular beach side holiday destination by people from all over the State. There are still many dedicated holiday homes in the area and the relaxing holiday ambiance remains. Houses in Old Quinns each have a unique style as they are all built around the natural lay of the land being sand dunes. There are two popular cafes within easy walking distance of Sun Studio and a general/liquor store for any last minute essentials - all located right on the beachfront. Joondalup, with its university campus, central services and major shopping complexes is less than 10 kms from Old Quinns. Ocean Keys shopping centre in Clarkson is less than 5 kms away.